An enthusiastic response from international buyers-and from those of the homegrown variety -to the recent launch of four grand country estates valued collectively at £65 million suggests that the recovery of the country-house market will continue to be led from the front. And not for the first time in 2013, as, earlier this year, competitive bidding by three international buyers led to the sale of the Hobhouse family’s 850-acre Hadspen estate near Castle Cary, Somerset, through Knight Frank (020-7629 8171) for about £12 million. The willingness of wealthy buyers to venture beyond the immediate environs of London in their search for a country estate bodes well for the current jewel in Knight Frank’s crown-the Lonsdale family’s Kingstone Lisle Park estate near Wantage, Oxfordshire, for sale, jointly with Strutt & Parker (020-7629 7282), at a guide price of £35m. At the heart of the estate’s 1,022 acres of lovely formal gardens, lakes, woodland, paddocks, parkland and farmland on the edge of the Berkshire Downs, stands Kingstone Lisle House, listed Grade II*, which stands close to the site of a 12th-century castle destroyed by fire in 1610. The present house dates from 1677 when the main central block was built for George Hyde. According to its listing, a new front was added in about 1720, the side wings by the then owner, Edwin Martin-Atkins, in about 1812, and the garden front, hall and staircase by his grandson between 1825 and 1830. The current owner’s family has lived there since 1943. In a county renowned for its magnificent country houses, Kingstone Lisle House is one of the most spectacular, but also one of the most tranquil, being one of few country houses in south-east England that are totally free from road noise, Rupert Sweeting of Knight Frank points out. An article by Marcus Binney in Country Life (June 17, 1971) describes the ‘extraordinarily spectacular’ entrance hall and flying staircase as ‘surely one of the most breathtaking surprises to be found in an English country house’. The rest of the interior is only marginally less impressive, especially the four fine reception rooms, among them a billiard room with a fireplace depicting King Alfred, who was born at Wantage. Luxurious sleeping accommodation includes a vast two-bedroom, two-bathroom master suite, 11 further bedrooms and five further bathrooms. For sale as a whole or in five lots, the estate has four secondary houses, a private golf course and an excellent high pheasant and partridge shoot. 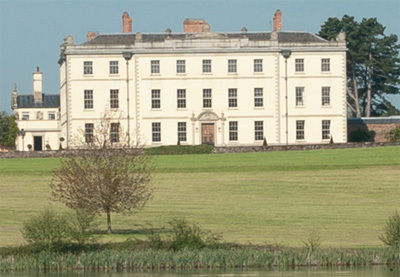 In contrast, a mere £15m could secure ownership of one of Herefordshire’s loveliest estates, the 1,180-acre Mynde Park estate at Much Dewhurst, seven miles from Hereford, but probably not without a fight, say selling agents Knight Frank. At its heart stands The Mynde, a palatial, Grade I-listed manor house, the oldest part of which dates from 1108. A succession of distinguished owners includes the Pye family (Walter Pye was attorney general to Charles I), from the 1350s until the early 1700s. In 1709, the Duke of Chandos bought the house and added the amazing Kings Hall with its wonderful plasterwork by Bugatti and Attari, described by Pevsner as ‘the finest room in Herefordshire’. The estate has been owned by the Twiston-Davies family since 1959, but no one lived in the ‘big house’ until the present incumbents, Audley Twiston-Davies and his wife, Caroline, completed a massive restoration of the entire building between 1997 and 2001. The imposing house stands in a magical parkland setting at the end of a mile-long drive, its lofty position designed to make the most of spectacular views over the lake, the park and the woodland beyond. Described by the agents as ‘deceptively compact inside’, The Mynde boasts, in addition to the Kings Hall, four grand reception rooms, a billiard room, various family rooms, two kitchens, four main bedroom suites and a library on the first floor, plus a further eight bedrooms and seven bath/ shower rooms on the second floor. Other estate buildings include The Little Mynde-a substantial ninebedroom secondary house with its own paddocks and parkland- an entrance lodge, six cottages and a range of traditional farm buildings. The lie of the land, a scenic blend of woodland, arable and lush pasture, also provides the setting for an excellent high-bird shoot. The timing of an estate launch is usually crucial in achieving a successful outcome. The fact that the Anderson family has chosen this moment to launch the remarkable Hamptworth Lodge woodland estate at Landford, near Salisbury, within the New Forest National Park, on the open market through Chesterton Humberts (01722 342393) at a guide price of £11m, suggests that now is as good a time as any to test the water. ‘Or at least, there are no good reasons not to,’ adds selling agent David Pardoe sagely. The ancient manor of Hamptworth dates from the 11th century. In 1603, the estate was bought by William Stockman of Barford, and in 1620, the first of a pair of hunting lodges was built for the Stockman family. In 1870, businessman George Morrison bought the estate and remodeled the house, both of which eventually passed to his nephew, Harold Moffatt, who trained as a boat-builder and woodworker, and established a notable collection of Elizabethan and Tudor furniture. The estate has been owned by the Moffat Anderson family ever since. Determined to have a house where he could best display his collection, on inheriting Hamptworth Lodge, Moffat dismantled the existing house and, replaced it, in 1910-13, with a new Tudor-style mansion designed by Sir Guy Dawber. The gardens surrounding the house were designed by Thomas Mawson. The grand main house, listed Grade II*, has some extraordinary panelled reception rooms, notably the vast Great Hall, its huge organ a twin of the organ at Salisbury Cathedral. In all, Hamptworth Lodge has almost 16,000sq ft of living space, including four/five reception rooms, 11 bedrooms, two bathrooms and a three-bedroom flat. The timeless woodland estate is being sold as a whole or in four lots.